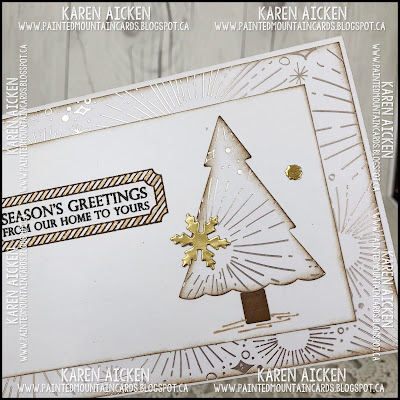 It's time for the November 2018 Karen Burniston Designer Challenge, with the theme: "CHRISTMAS TREE" - make a card that incorporates a Christmas tree. Since the Christmas Tree's Pop-Stand has been re-released, I decided to do a version of my Designer Challenge card from several years ago. This card is 4 x 9", and fits perfectly in a #10 business envelope. 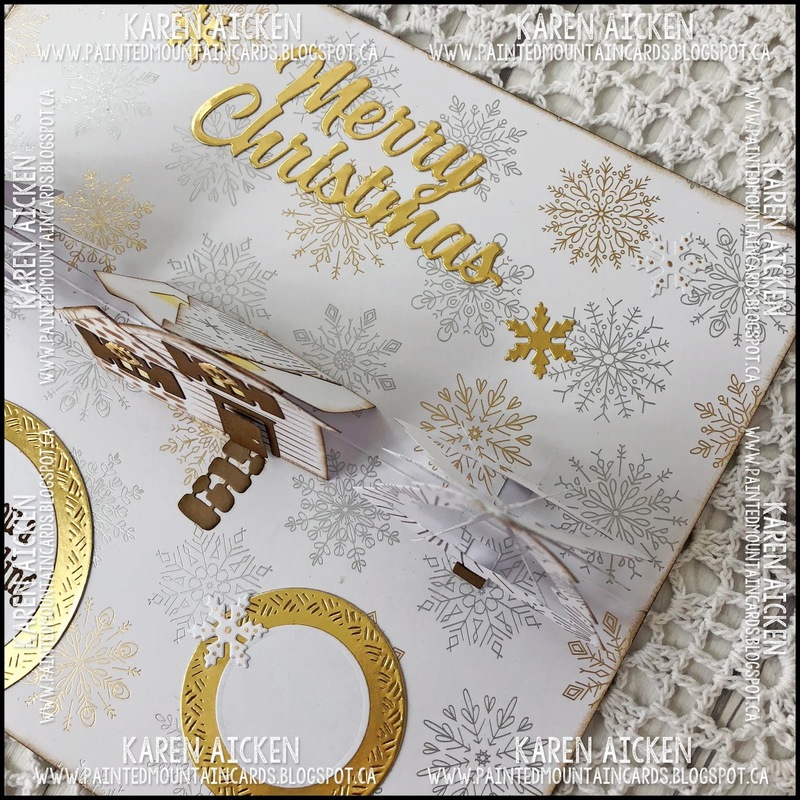 There are three gold 'dots' on the card front, and they are actually the fall away pieces from the little wreath's I used to decorate the house windows and tree tops inside the card. ... and here it is fully open! 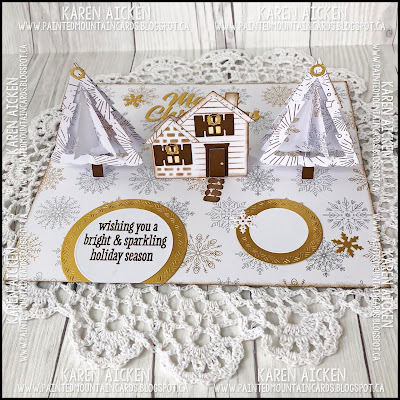 I cut a third pop-stand in the centre of the card, and two of the house shapes from white card stock. Then a house was adhered to each of the flaps similar to doing the trees - and then both house pieces were attached together at the roof peak. Love the new Merry Christmas - such a great font and I love that it cuts as a single piece. 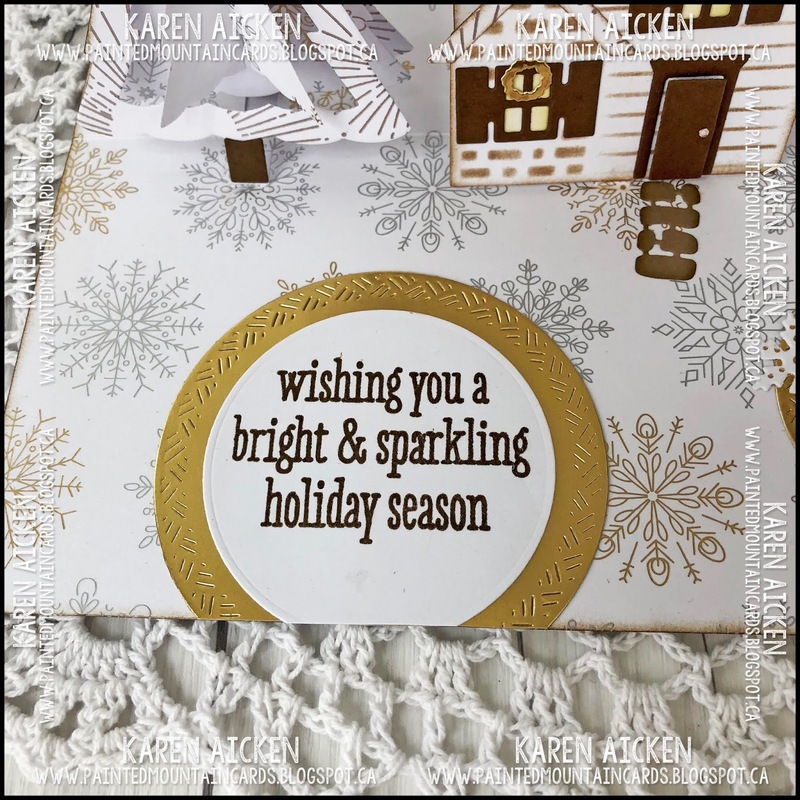 The patterned paper I used has lovely gold foiled bits in it so this is a very sparkly card for the holidays. Below you can see the gold wreath's that I added to each of the windows on the house. 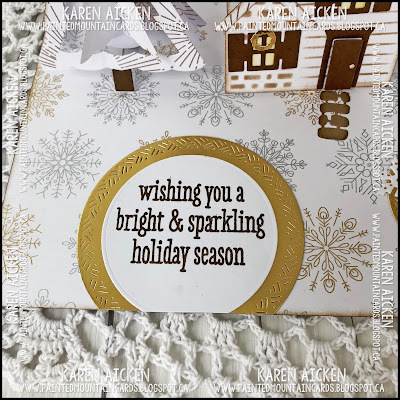 I used the stencil feature of the die and a light brown ink to add the design to the house front. To make this card, I cut the patterned paper 8 x 9", and scored it down the centre on the 8" side. That gave me my 4 x 9" top fold card. Then I simply folded it on the score line and centred the Pop-Stand die where I wanted my trees to go with the nubs centred on the fold. It fit through my Big Shot and cut through both layers at once. I hope you will check out what the rest of the Design Team came up with for the challenge - their blogs are linked on the right. 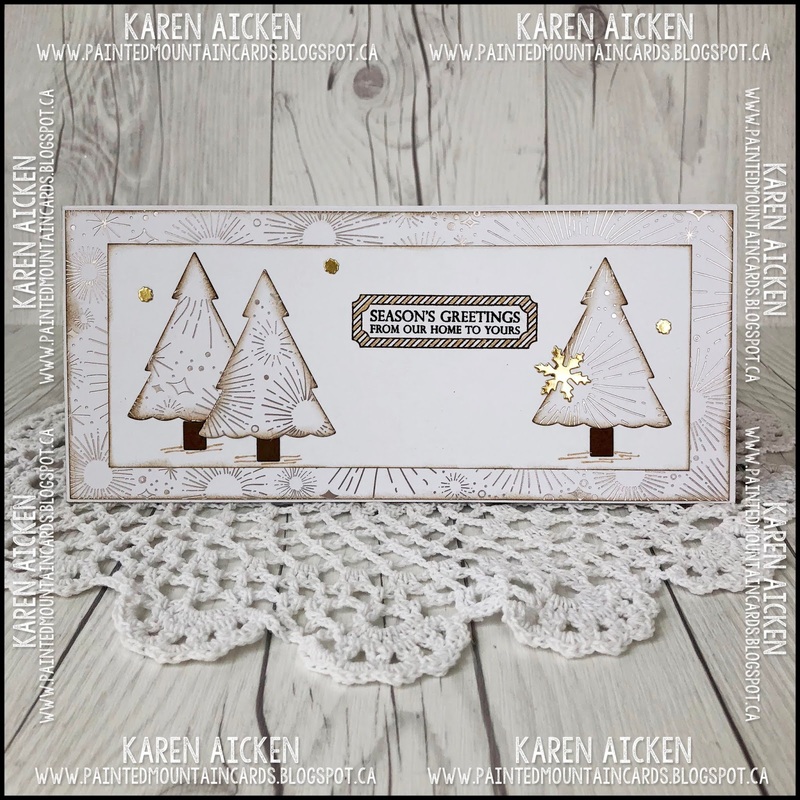 Karen Burniston will have her post on her blog tomorrow (Wednesday November 7th). Card size - 4 x 9"
I have had a love affair with paper and scissors as long as I can remember. 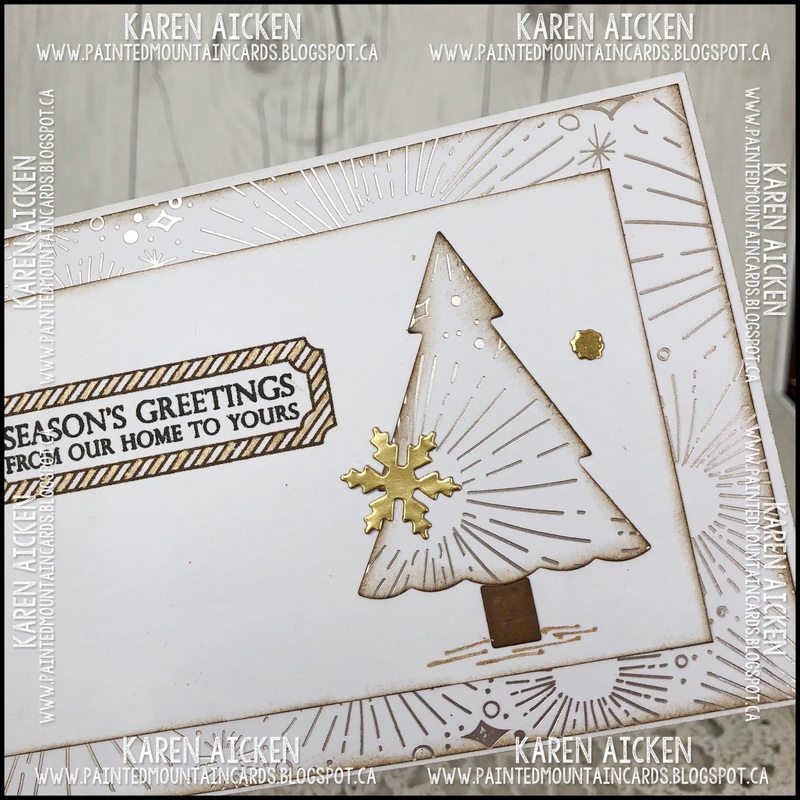 Card stock, stickers, stamps, ink, dies ... I love it all. I took up Loom Knitting in 2011 and also really enjoy knitting without needles so started a blog to share my creations with others. On a road trip in 2015, I stumbled across Zentangle and was immediately hooked. 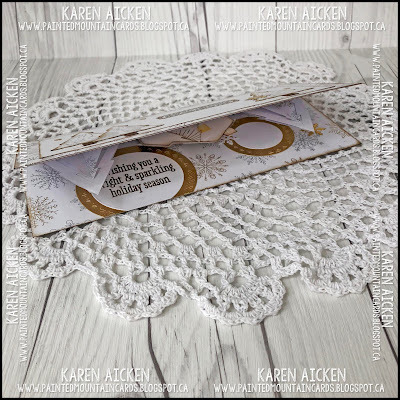 Instead of combining my Zentangle with my card posts, I have now started a blog for that as well! I live in Alberta Canada, with my DH and 2 furry kids. Note, I made the background for my Loom Knitting and Card blogs using papers from digital kits by Gina Cabrera at Digital Design Essentials. 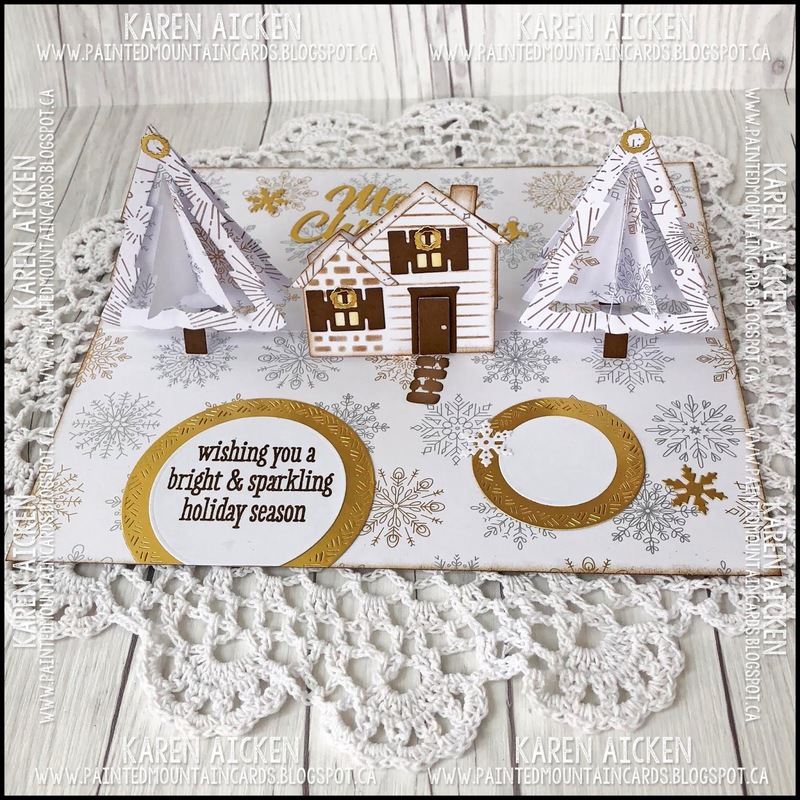 Painted Mountain Cards Blog is a personal hobby blog with the sole purpose of sharing paper crafting projects. I don't make use of any personal information shared in any comments or any third-party applications such as email subscription services. Sometimes I receive free product to use in my projects. My opinion is always my own, and if I am promoting a product it is because I truly like it and not because it was gifted to me. I love Your Next Stamp products!